Japanese Black Beef, a fusion of two histories, only in Kagawa. 'Olive Beef' is a type of Japanese Black Beef produced in Kagawa from Sanuki cattle that are reared for at least two months on feeed containing 100g or more of olives, as defined by the Sanuki Beef Brand Promotion Association. The history of beef in Kagawa goes back 700 years to cattle grazing and in 1882 Shodoshima became on of the first locations in Japan to implement fattening of cattle. Towards the beginning of the Taisho Period (1912-26), Sanuki Beef established itself as a respected brand in the Kyoto-Osaka-Kobe region. 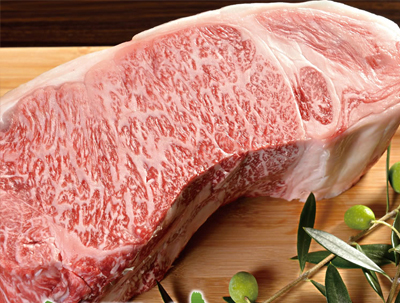 High quality Sanuki Beef was produced as a result of untiring efforts, a beneficial climate, and local fattening techniques. Similarly the olive tree is the prefectural tree of Kagawa, and Shodoshima, which was the birthplace of olive cultivation in Japan, boasts over 100 years of history. With the combination of these two legacies, and the success of local catttle farmers on Shodoshima using teh leftover olives from olive oil production in feed, the premium Japanese Black Beef, "Olive Beef" was born. 'The secret behind the deliciousness of Olive Beef is the oleic acid and antioxidants that are so abundant in olives. By using these olives in cattle feed, the fat producedis one of a clean richness, and it draws out the natural softness and umami of the meat. 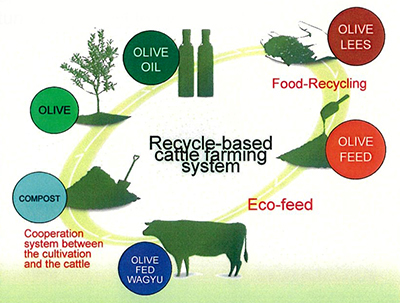 Olive Beef is a brand guarantee for the quality of Sanuki cattle and the deliciousness of olives.